I have gotten it in my mind to try and build an enormous track saw – I deal with a lot of thick slabs being able to cut them with the precision and accuracy of any of the nice track saws would be fantastic. Obviously, this means a lot of cutting depth, enough to cut a 2.5” slab in one pass at 45 degrees. I intend to put a finish blade on it and mess around with adding dust collection, but that is it. The only thing that holds me up is the pivot point. Does anyone know where the point of rotation is located? 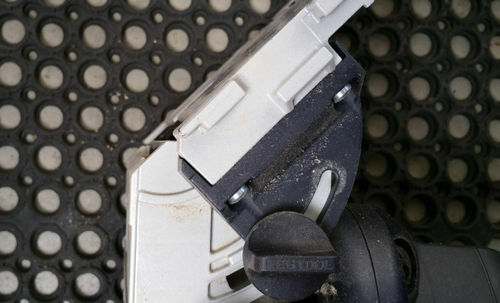 On the Festool TS 75, you can set it to cut at any angle and it will still manage to cut right on the line, without the need to make a track for each angle. Is this accomplished by the extreme thin-ness of the track itself? The low “stack height” , if you will? 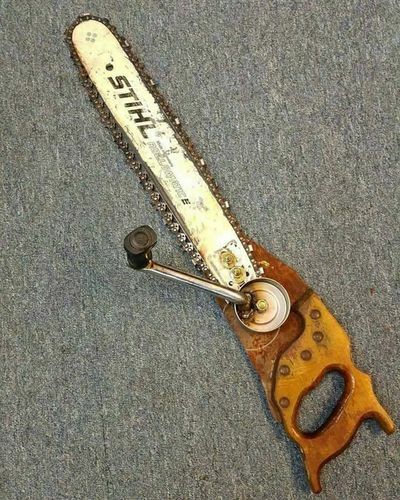 Or is there some other special piece of engineering within the saw that makes this possible. and still cut on the same line. 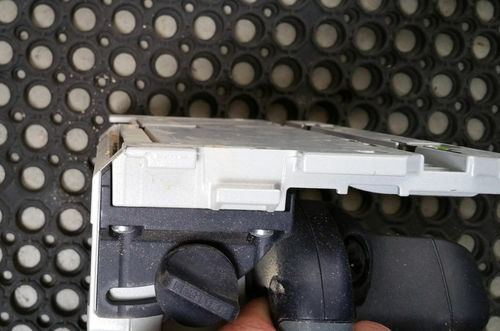 rubber strip on both edges to control tearout. point by that amount shifts the cut line. Prazi $169 12” BEAM CUTTER – MODEL PR-2700 I still think you could get a real nice cut with the Festool Jigsaw with long blades. I have the EZ Track and they make plates for larger circular saws. But as Loren said the saw base and track would put you just short your 2.5” target. Contact them and tell them what you want to do. They have a lot of variations available. Dino the guy that runs the company is very helpful. Ok – so only a couple weeks into my project, and the idea is all but dead (the mind of any good inventor is littered with discarded concepts). newTim lent me his TS75 to use on a project and I have had some time to really consider it more. I’ll probably be getting the Festool for what I need. 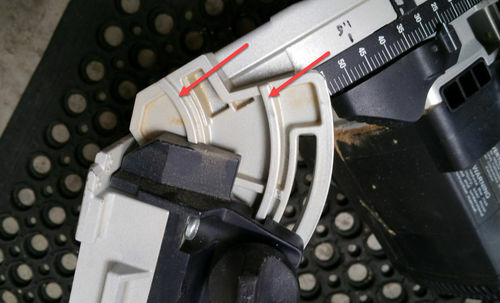 Having sketched out a bunch of track systems and looking at what is available commercially, many of them, even with that monster of a circular saw from Milwaukee have such a high stack it puts me back to a 3” or 3 1/8” vertical cut. That’s better than the Fes, but really only by about 3/8 of an inch. And the accuracy of a good track saw makes it pretty trivial to flip a piece over and cut through on exactly the same line as before. The chainsaw options including the sword saw have a 10mm kerf and don’t leave a finish-ready surface, a big deal in my furniture niche. Not to mention that the pivot problem still exists for the MonsterTRACK saw, you’d need to buy/make seperate guides for each angle you want to cut for true accuracy, and in a production environment, fussing with a bunch of guides just doesn’t work. Hell, even having to clamp the damn thing down is too much. The only situation where the big saw really shines is being able to miter a big slab in a single cut, but again, having see the accuracy of the TS, flipping and ripping the same line is super easy. Also in 5 years I have had to do that exactly one time, so how big of a problem is it really? Guess my shop’s getting more green…. but maybe I’m wrong to be skeptical. suspicions and found this thread. enough that I’m alway skeptical. Here’s another thread that addresses the issue. Mafell makes a Beam Saw that works with their track systems but the price is somewhere out of this world and not sure if you can use the track if you need 45 degrees. Hey Loren, that is a good point – I thought that might be a problem so I went and tried it in the shop. The thing to do is really make two/three cuts. First is a cut to actually part the material at the angle you want, but slightly proud of the line. then you move the saw over 1 kerfwidth onto the line and run the cut again on each side to clean it up. The now-exposed saw blade stays very cool and delivers a clean cut. Total Kerf width for the cut was about 6mm. Not a perfect solution, but it works! wuddoc and AlaskaGuy, those beam saws are awesome. Mafell pricing makes me feel poor even though I’d happily pony up for Festool… amazing.